This Daruma is about 7 cm long. 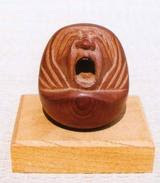 In old Japan, wooden kokeshi dolls were often given to teething babies. 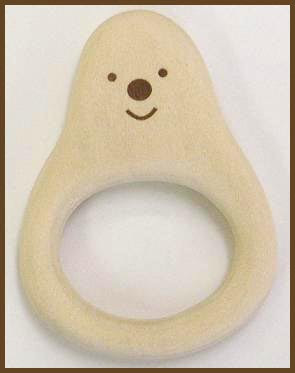 Teething rings have been around for thousands of years. The first recorded use has been found on Sumerian sandstone tablets, around 3000 years ago. The Egyptians used coral teething rings and they had a head of Bes inscribed, a god associated with child welfare. They also wore a child's first shed tooth as an amulet against the pains of teething. Parents in the 1600s used white candy sticks as teething rings for their children. Gum sticks and gum rings were also used in the 17th and 18th centuries. Wax candles were popular as gum sticks, as well as sticks of liquorice dipped in honey. Legend has it that in 1683 in Vienna, Austria, a local Jewish baker wanted to thank the king of Poland for protecting his countrymen from Turkish invaders. As bagels gained popularity in Poland, they were officially sanctioned as gifts for women in childbirth and mentioned in community registers. Mothers used them as nutritious teething rings that their infants could easily grasp - a practice still popular today. comes from the nineteenth century, when it was common practice for well-off parents to use a silver spoon as an aid to relieve the discomfort of teething. The well-healed also like to use teething rings made from mother-of-pearl. During the mid-nineteenth century gum rings were manufactured using rubber. Within a few short years rubber had replaced other materials such as coral, bone, ivory and bread-crusts. The early rubber teething rings came in three colours, white, blue and black. Unfortunately, the white rubber models contained large quantities of lead! 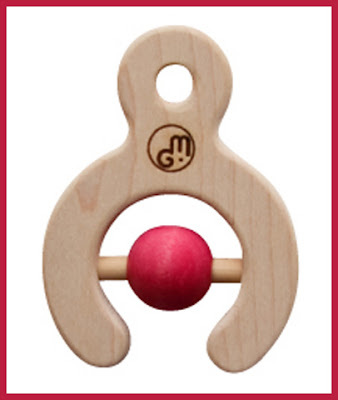 It comes with a red or blue bead or all made in wood.
. Baby bib - yodarekake よだれ掛け .